Hearing that the classic 37m motor yacht Atlantide is sold, I call her broker, David Campbell at Freedom Marine in Vancouver, Canada, who confirms she was sold to a direct client. 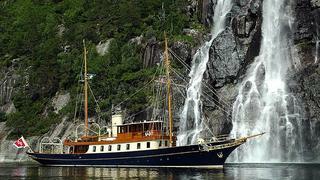 Atlantide was built in 1930 by Philip & Sons in Dartmouth, UK, to a design by Alfred Mylne. In 1998 she was bought by the legendary yachtsman Tom Perkins who resolved to return her to a gentleman’s yacht condition. Thus in 1999 she went through a complete rebuild at the Camper & Nicholsons yard in Gosport, UK with an exterior and interior design by Ken Freivokh. Accommodation is for six guests in a master suite, VIP stateroom and a double cabin while two rugged 230hp Gardner engines give her a cruising speed of 10 knots. Now moving to America's East Coast, Atlantide was asking €5 million.